Image from Craigslist. Art by Jason Torchinsky. To Detroiters hunting for a car on Craigslist, consider this a warning: The phrases “no rust” and “a little rust” do not mean what you think they mean. But fear not, for today I shall decode the special language used among Motor City automobile sellers. I’ll admit that I spend most of my waking hours browsing the Detroit Craigslist in search of some sort of rust-free project, regularly passing out at my keyboard after failing to find a single inexpensive example without a hole through the rocker panel. Though this may sound pathetic and sad, at the very least I can say I have learned something, and it’s that many Detroit Craigslist sellers are straight-up liars when it comes to their descriptions of how much rust their cars have. They say their vehicles have no rust, but it simply is not true! And yes, the concept of a Craigslist seller lying about a vehicle isn’t exactly unique to Detroit, but I think the issue here in the heart of the rust belt isn’t really that the sellers are intentionally in denial, it’s that they’re so used to total garbage that they’ve literally lost all understanding of what a “rust free” car should look like. 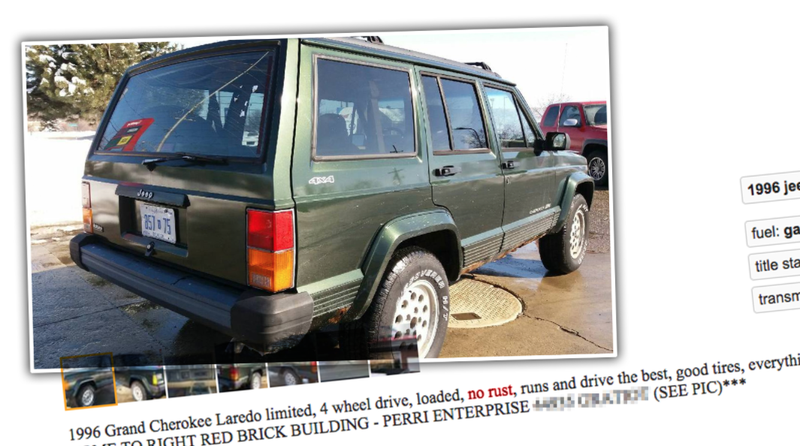 Looking closely at those images, it’s clear that “no rust” clearly doesn’t mean “no rust.” Sure, the Jeep may be structurally sound, but just have a gander at the rockers and at the rear quarter panel. They’re completely rusted through! Now, unless this guy drove through a puddle of chocolate pudding, that front bumper is clearly being eaten by our old nemesis Fe2O3. Where’d it go? There’s a solid two feet of it missing! But OK, one side is bad. The good thing, though, is that the owner says the rust is consolidated to “the rocker panel,” implying that the issue applies only to a single side. Anyway, this whole post is just a warning to Detroit car-nuts innocently browsing Craigslist. I don’t want you getting your hopes up like I once did when a seller of a $400 XJ Cherokee told me his Jeep “had a solid frame.” I wound up in a sketchy apartment complex, trying to yank my flashlight out of the unibody rail I had just pushed a big hole into. -No rust (nō-rəst): Surface rust; maybe a few small holes. -A little rust (ā,ə-ˈlidl-rəst): Quite a few rust holes. The rocker panels and fenders probably look like Swiss cheese. -Some Rust (rəst): There are no floors or rockers left. The fenders look like they’ve been chewed on by a rabid beast. -Rust (rəst): This thing is a freaking death-trap. -Has A Solid Frame (haz-ā,ə-ˈsäləd-frām): Expect the frame to exist in some form, but the rest of the body will be wrecked beyond belief. -Major Rust (‘mājər-rəst): You’ll be shoveling this car into a bag with a broom and a dust pan. Only if the listing specifically says “From Out West” (frəm-out-əv-stāt) is it possible that the car truly has no traces of rust. Even then, who the hell knows how long it’s been in Michigan. So there you go; the next time you read a Craigslist post in which a seller claims their vehicle has no rust, you’ll know what to expect. You’re welcome. Though if you want really good advice, maybe just don’t try to buy rust-free used cars off of Michigan Craigslist. Rust Is Bad. Especially In MIchigan.